And a content update, but who cares, capes, right? Crafty Xbox One and PS4 owners and their versions of Minecraft have another reason to celebrate console sandboxing. 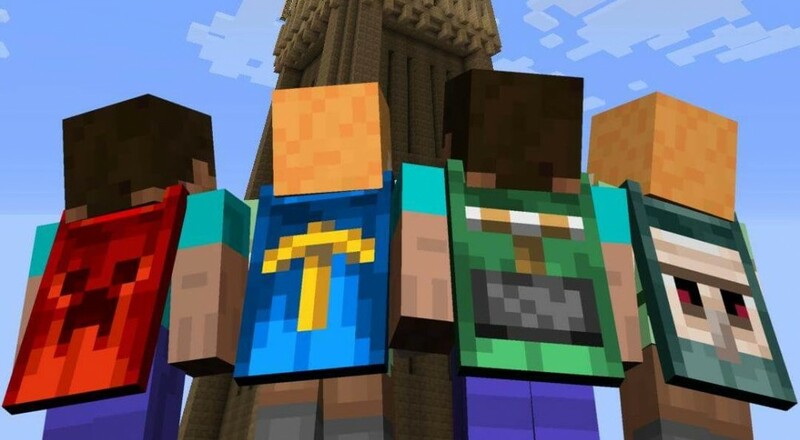 Minecraft's controller-based cousins now have a new limited edition skin pack to celebrate Minecon 2015, and it comes in the form of capes. Lots and lots of capes. Ok, so four capes, but they're free, so who's gonna complain? The download is available now through July 15, making this the last weekend you can strap a lever to your back as the Minecraft version of a "kick me" sign. The other capes include a totally non-scary villager face, a golden pickaxe, and a nice and fiery creeper mug that stares at everyone walking behind you. Also on the way is a new update for the console versions of Minecraft. This patch adds some new game options and customization toggles to help you tweak your game. Hate mountains and caverns? Flatten things out on your next map. While you're strolling around Great Plains World, check out the oak, spruce, birch and jungle wood types, as well, or play around with inverted daylight sensors, trapdoors, stained glass, and books and quills. You can also mess with the difficulty, spawn position, ambient cave sounds, and weather without leaving your session! Go forth to your respective console download stores and grab the free capes right away. The clock's ticking.